3/20/13 by Peter Manseau- GROWING up in New England around a community of former priests who considered themselves in exile from the Roman Catholic Church, I often heard of a mythical-sounding place where ecclesiastic strictures like celibacy were more flexible than they were in parishes closer to home: South America. It was once understood that men who left the priesthood would relocate at least 500 miles from where anyone might recognize them as priests. How would it look to see a man with the power of transubstantiation in his hands pushing a stroller down Beacon Street or kissing his wife while on line at the Coolidge Corner Theater? Such a blurring of boundaries was the kind of thing that could, it was said, “give scandal to the faithful.” To remain in the diocese that had made him a priest was a way for my father to show that he was not ashamed of the choices he had made — neither of being ordained, nor of being married. Yet the church of the Southern Hemisphere offered an intriguing parallel universe. Free of the social uncertainty that plagued the Roman faith in the largely Protestant United States, the majority Catholic nations of Latin America seemed to have reached an accord between the pious and the practical. From missionary friends we heard tales of how different the situation was in Peru, for example. 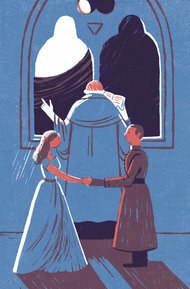 Married Catholic clergymen may not have been canonically sanctioned, but the existence of families made up of a priest, a wife and children was an acknowledged part of the culture — a “widely accepted outlaw priesthood,” as an Associated Press story once called it. Not only had Podesta married in 1972, he had also devoted the rest of his life to winning recognition for priests who had made similar choices, and for the women with whom they now shared their lives. Mandatory celibacy itself, Podesta suggested, was based largely on “the undervaluation of women” and the notion that men tainted by female contact should be prohibited from approaching the altar; to rectify this situation, he enlisted his wife as a concelebrant during Mass. It may yet prove telling that among the few church officials who could see them was a top leader of Argentina’s Catholic Church. Long before anyone considered him destined for the papacy, Jorge Mario Bergoglio, then the archbishop of Buenos Aires, visited Podesta as he lay dying to administer the sacrament of the anointing of the sick. At the time, a quarter of all ordained men in Latin America were abandoning the priesthood early, just as Protestant denominations, unhindered by the rule of celibacy or the Catholic Church’s politically problematic past, were on the rise. Is it possible that Archbishop Bergoglio did not pause to wonder if the path taken by the man now before him might represent a local solution to problems that seemed intractable from the distance of Rome? But recognition can be a sign of something more significant. A decade after Podesta’s death, Archbishop Bergoglio, now a cardinal, spoke about celibacy with the candor of a man who never imaged he would be pope. As the church approaches its commemorations of the crucifixion and the resurrection, Catholics will contemplate how death can lead to new beginnings. One day they may see a further example in the visit of a future pope to a married bishop. According to the bishop’s widow, the man now known as Francis continued to check on her long after her husband died. Such a blurring of the boundaries between private flexibility and public power no longer gives scandal to the faithful, but hope.